I believe I understand how to embed a single google calendar no problem. 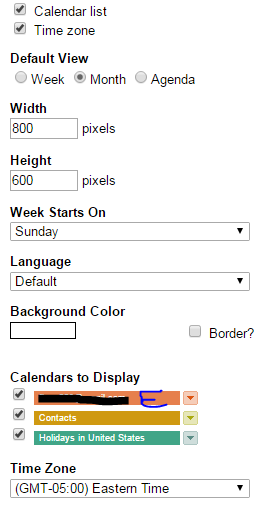 I simply goto settings > select my calendar > click customize > and then I can customize how I want it to look. I know there are many examples of how to do this part. Please read further for how I am having problems with more users for the embedding tool part. Notice how the "E" email address shows up but the "C" one does not. So how do I get calendar "C" to show up on the embedding tool? I did not find a direct way to have the "C" calendar show up on the joined account "A". The work around I did find is if I went into account "E", (which did display correctly on A) shared calendar "C" with "E" and selected it inside of calendar "E". Once I had it selected actually then it started to show up on calendar A. Does Google Calendar and its Outlook sync tool support multiple Outlook users? How can I display the events from two Google Calendars in a single iframe?